Throughout the evolution of the British rifle the name Enfield is prevalent; this refers to the Royal Small Arms Factory in the town of Enfield north of London, where the British Government produced various patterns of muskets from components manufactured elsewhere beginning in 1804. The first rifle produced in whole to a set pattern at Enfield was the Baker rifle. Brunswick rifles were also produced there, but prior to 1851 rifles were considered specialty weapons and served alongside the muskets which were issued to regular troops. The Royal Small Arms Factory (RSAF) was a UK government-owned rifle factory in Enfield, now part of north London, which produced British military rifles, muskets and swords from 1816. It closed in 1988, but some of its work was transferred to other sites. The factory was located at Enfield Lock on a marshy island bordered by the River Lea and the River Lee Navigation. It was built on the instructions of the Board of Ordnance near the end of the Napoleonic War. The land was acquired in 1812 and the factory completed by 1816. 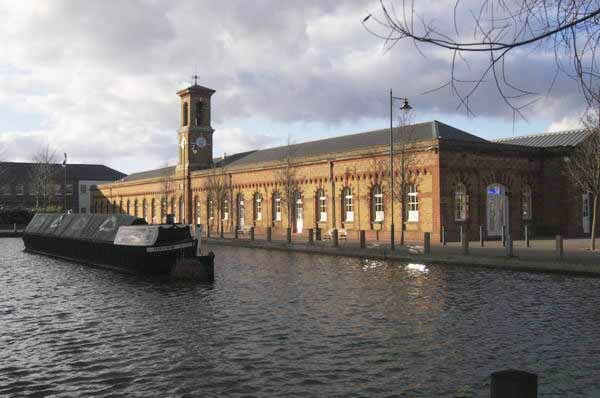 The site had the advantages of water-power to drive the machinery and the River Lee Navigation for the transportation of raw materials and finished weapons. The RSAF was originally all situated on the east side of the Lea, in the county of Essex in Waltham Abbey parish, Sewardstone hamlet. The course of the river was diverted during the life of the factory, and part of the site then fell in Enfield parish. Local boundary changes initiated by SI 1993/1141 after it closed transferred the site entirely from Epping Forest (district) to the London Borough of Enfield. The original ambitious plans by Captain John By included three mills. Later, the engineer John Rennie recommended the construction of a navigable leat. The leat was made, although only one mill with two waterwheels was completed. In 1816 the barrel branch was transferred from Lewisham; and by 1818 the lock and finishing branches had been moved to the site, enabling the closure of the Lewisham factory. A sword-making department was set up in 1823. The factory fought off the threat of closure in 1831; and remained quite modest in size until the Crimean War of 1853/1856, which resulted in vastly increased production. 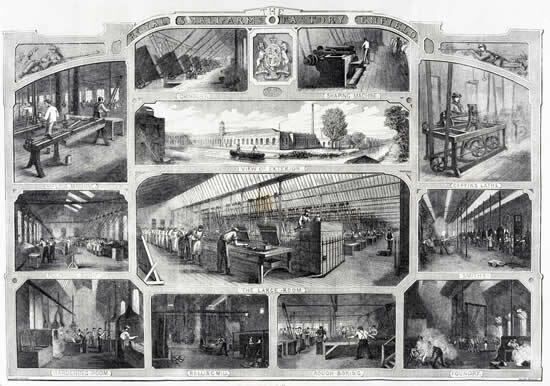 By 1856 a machine shop was built on American mass-production lines, using American machinery powered by steam engines. The shop was based on a design by John Anderson designed the shop and built by the Royal Engineers. The workforce increased to 1000, and by 1860 an average of 1,744 rifles were produced per week. In 1866 another major expansion took place, when the watermill gave way to steampower. The total number of steam engines grew to sixteen; and by 1887 there were 2,400 employees. Production of the new model rifle designed by James Paris Lee begun in 1889. The famous Lee Enfield rifle was designed in 1895. The factory expanded again in World War I; and in World War II. Two other Royal Ordnance Factories were set up in World War II to manufacture rifles designed at RSAF Enfield, and to greatly increase its capacity: ROF Fazakerley and ROF Maltby. Both of these have long been closed. Decline set in after World War II; and in 1963 half the site was closed. The Royal Small Arms Factory was privatised in 1984 along with a number of Royal Ordnance Factories to become part of Royal Ordnance Plc; and was later bought by British Aerospace (BAe). They closed the site in 1988. The factory was set up because of disappointment with the quality and cost of the existing British weapons used in the Napoleonic War. At this time in Britain, they were built as individual gun components mainly in the Gun Quarter, Birmingham by a number of independent manufacturers and then hand-assembled to produce rifles. These component makers eventually combined to become the Birmingham Small Arms Company. The Enfield factory was intended to improve the quality and to drive down costs. The RSAF, Enfield, was famous for its Pattern Room which was a collection, or master set, of every weapon made at RSAF Enfield. After closure this collection was moved to ROF Nottingham; which has since closed. The collection is now held at the Royal Armouries Museum, Leeds. Local government boundary changes meant that the majority of the site was now within the London Borough of Enfield. The necessary outline planning permissions were obtained for site redevelopment; making closure of the site attractive to its new owners. Closure was announced on 12 August 1987, shortly after privatisation, and the site closed in 1988; the machinery was auctioned off in November 1988. BAe then formed a joint venture with the property company Trafalgar House to redevelop the site. The majority of the site is now covered by a large housing development. The original machine shop frontage and the older part of the rear structure has been retained and was converted into workshops and retail units by the Enfield Enterprise Agency, making use of European Union (ERDF) funding. The new development is called Enfield Island Village. The Interpretation centre can be viewed by appointment only.